Eratzeni “Cheni” Ontiveros is the Mexico Accounting Lead located in Scarbrough’s corporate office in Kansas City, MO. Cheni has been with Scarbrough for over three years. 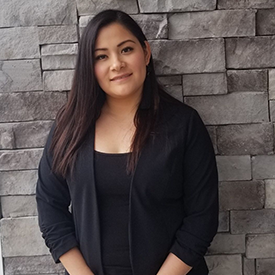 Throughout her journey with Scarbrough, she has been able to learn accounting and fiscal rules and regulations from both jurisdictions in the United States of America and Mexico. She is currently an accounting major at the University of Missouri-Kansas City. Cheni is also bilingual, which has been a key aspect to providing customer service to our clients in Mexico. Cheni has provided much value when traveling to Mexico with our corporate accounting team. She handles all customer and vendor accounting communications for our clients that use our Southern Border services. She ensures we are compliant with the SAT Administration which is equivalent to the United States’ IRS. In Mexico, SAT and Mexico Customs are directly related and are both under the Mexican Federal Secretary of Treasury. Eratzeni is a unique name. Eratzeni means: Persona de Ideas elevadas – it would translate to “Wise person” this name come from the Purépecha tribes that dominated Michoacán. Cheni’s favorite travel spot is her home town in Mexico. Jungapeo is a municipality in the eastern part of the Mexican state of Michoacán. Along with raising her three kids, Cheni loves nature and outdoor activities. She especially loves soccer, as she participates in a club league in her spare time. The purpose of our Scarbrough Spotlights are to introduce our clients to their dedicated reps and get to know them better, so enjoy! If you have interaction with Cheni, feel free to send her a message and say hello at eontiveros@scarbrough-intl.com.